Prime Minister Narendra Modi on Thursday flagged off the first low-cost Shimla-Delhi flight near Shimla, and said his dream is to see a person wearing slippers fly in an aeroplane in the country. "My dream was to see a person wearing a 'hawai chappal' fly on the 'hawai jahaz' (plane)," he said in his almost 20-minute-long address in Hindi. During his day-long visit to the Queen of Hills, which witnessed a light shower in the morning, Modi underscored the need to keep air fares within the reach of the middle class. Air India subsidiary Alliance Air, which will operate the Delhi-Shimla flight, has fixed the one-way fare at Rs 2,036. He said the UDAN scheme caters to the aspirations of the Indians, making flights cheaper than taxi fare. "The lives of the middle class people are being transformed and their aspirations are increasing. Earlier, aviation was considered to be the domain of 'Raja-Maharaja' and the elite. That has changed now," Modi said. The Prime Minister said he foresees tier-II and tier-III cities as "growth engines" given the untapped potential of the country's aviation sector. "If aviation connectivity in tier-II and -III cities is enhanced, it will be beneficial," he said. "The UDAN scheme is going to help tourism in Himachal Pradesh," Modi said. He said that in the absence of an aviation policy in the past 70 years, a large number of airstrips were lying idle. These airports will now be put to use under a policy formulated by the present government and 30 such airports will start commercial operations, he said. Annual tourist arrivals in Himachal Pradesh crossed 1.8 crore (18 million) in 2016. The tourism sector's contribution to the exchequer is approximately seven per cent of the State Gross Domestic Product. Modi also laid online the foundation of a hydro-engineering college in Bilaspur district. 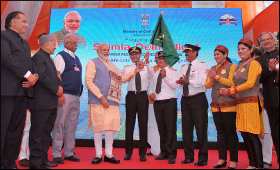 Accompanied by Himachal Governor Acharya Devvrat, Chief Minister Virbhadra Singh and Union Ministers P. Ashok Gajapathi Raju, Jayant Sinha and J.P. Nadda, Modi simultaneously flagged off the inaugural UDAN flights on the Kadapa-Hyderabad and Nanded-Hyderabad sectors through video-conferencing. The Shimla airport had been shut for scheduled flights since September 6, 2012, affecting tourists and business travellers. A regular to and fro Delhi-Shimla flight will be operated five days a week from Wednesday. The operations under the scheme are intended to provide air connectivity to unserved and remote routes, the Ministry of Civil Aviation said in a statement. The scheme caps airfare for an hour-long journey of approximately 500 km on a fixed-wing aircraft or for 30-minute journey on a helicopter at Rs 2,500. The UDAN Scheme is a key component of the National Civil Aviation Policy released on June 15 last year. On March 30, the central government awarded contracts to five companies to operate flights on 128 routes that will connect 70 airports in India.